At least someone is enjoying the winter. The squirrels also seem to be having a fine time, with their tails as curved and compact as croquet wickets. I dream of that big bus south. Once, we took the train all the way from Boston to Tampa in deep winter and I still remember how it felt to fall asleep glimpsing at the icicle-resembling obelisk of the Washington monument and wake rockingly in Georgia where everything was softer and green even at that season and dogs loping across their yards to sniff what was new in the soil that day. Ah! How long until I can I go south myself, even for a few days? How long oh Lord? But you know what? It’s not enough to just give you the link to that montage. Let me insert it right here. 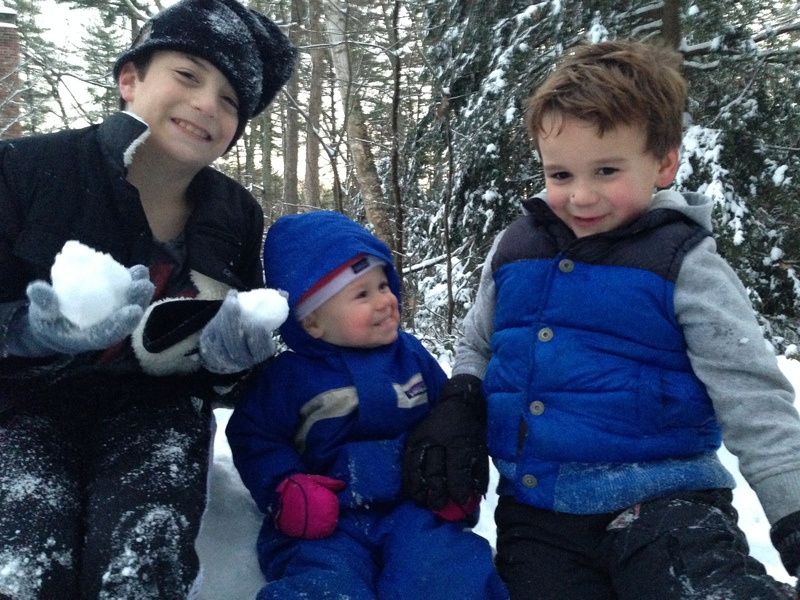 My winter memories of small children are the simple equation: the time it takes to insert three children into snowsuits, hats, scarves, mittens, and boots is the exact amount of time it takes at least one of them to decide they need to go potty. Right now. this one made me laugh Barb! What is harder than dressing a baby in a snowsuit? I feel for the undertakers every time I have to do it..
We have a pair of cardinals here. Love them against the winter snow.